Pope Dismisses Explosive Testimony Of Abuse Cover-Up: I Will "Not Say One Word"
Speaking to reporters on a flight returning to Rome from an official visit to Dublin on Sunday, the Pope indicated he will not respond to explosive charges from a top Vatican official that the pontiff knowingly covered up widespread sexual abuse. 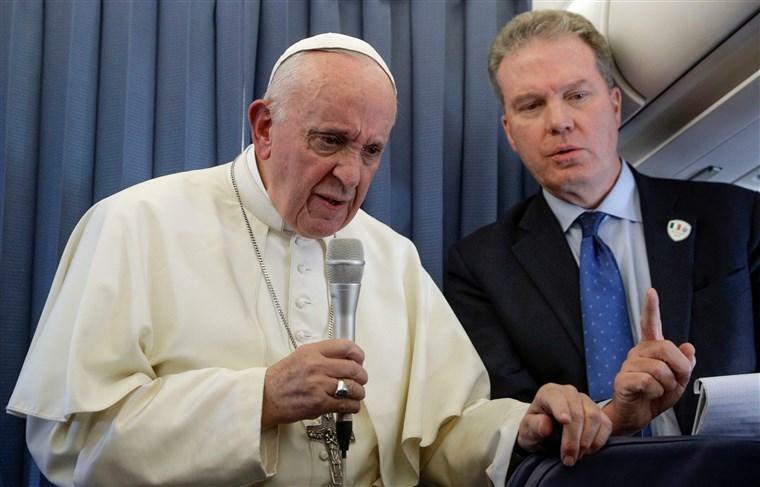 The Pope dismissed a bombshell document containing the charges which emerged Saturday night, saying simply that the allegations "speaks for itself" and that he would "not say one word" on the matter. According to Reuters, "The pontiff said journalists should read the document carefully and decide for themselves about its credibility". The extraordinary 11-page written testament, one which the NYT's Ross Douthat called a "truly historic bombshell", contains former Vatican ambassador to the US Archbishop Carlo Maria Viganò's detailed allegations concerning "who in the hierarchy knew what, and when," about the crimes of Cardinal Theodore McCarrick. McCarrick was stripped of his office last month by Pope Francis over claims he routinely sexually abused seminary students and an eleven-year old altar boy, something which one New York City priest told CBS News, "virtually everyone knew". Viganò's testimony implicates a host of high-ranking churchmen on up to the pope himself. The Pope responded to reporters accompanying him on Sunday: "I read that statement this morning. I read it and I will say sincerely that I must say this, to you (the reporter) and all of you who are interested: read the document carefully and judge it for yourselves." And further: "I will not say one word on this. I think the statement speaks for itself and you have sufficient journalistic capacity to reach your own conclusions," Pope Francis said. Meanwhile Vigano said that he told Pope Francis in 2013 about allegations of sexual abuse against a prominent priest — and that Francis took no action. Now 77-year old Archbishop Viganò is calling for Francis to step down. It is extraordinary and somewhat unprecedented that the Pope should so quickly be on the defensive in front of reporters, the way a politician would; however, the allegations are coming from the top of the American hierarchy and arguably the single most powerful and in-the-know figure concerning the goings-on in the American church: the very man who served as apostolic nuncio in Washington D.C. from 2011 to 2016. 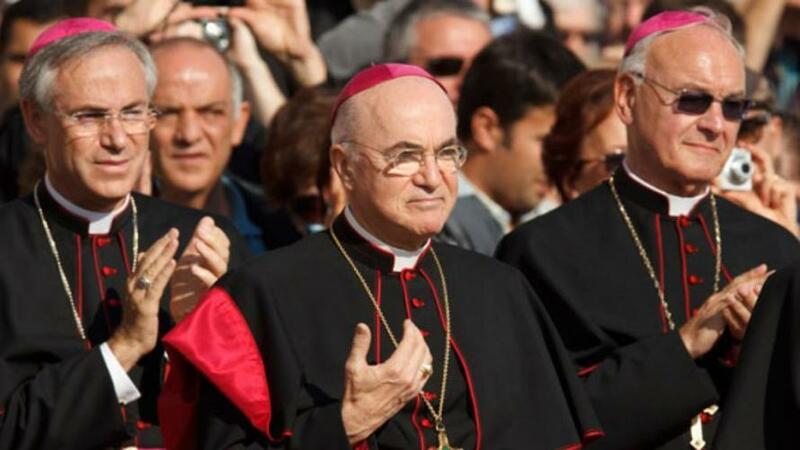 Monsignor Carlo Maria Viganò (center) said now deposed Cardinal Theodore McCarrick regularly invited seminarians to his bed, and that it was widely known among church officials. The former Vatican official said Benedict had “imposed on Cardinal McCarrick sanctions similar to those now imposed on him by Pope Francis” and that Viganò personally told Pope Francis about those sanctions in 2013. Also contained in the letter are accusations against a long list of current and past Vatican and U.S. Church officials charging that they too covered up case of the 88-year old former McCarrick. Likely, the Pope will continue being under fire until he takes on some of the specific allegations. His official visit to Dublin, where he addressed Catholics at an outdoor mass and begged for the forgiveness of the laity for recent scandals facing the Church, was marred by protests as he passed by crowds.